Like soothing French Lavender and exotic Egyptian Jasmine, with a touch of Fir Pine. 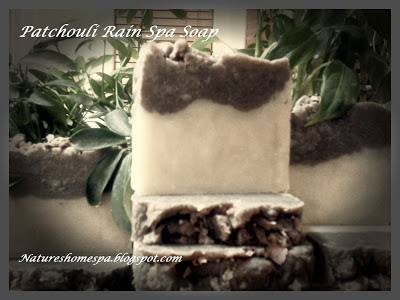 "Patchouli Rain". This soap is made with rain water, the softest water on earth! called "Relaxing", that really makes a soothing, relaxing gorgeous scented bar. grapeseed oil, shea butter, and a soybean/palm blend. No parabens, formaldahyde, SLS's . Ever. Oh Anna, the fragrance mix sounds wonderful. So naturally and with the rain water very soft and very tender. You're so busy. 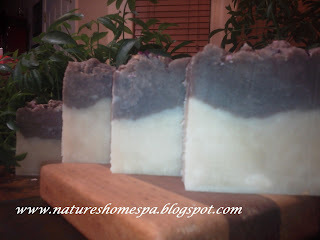 Hi Doreen, I am happy you like the Patchouli Rain soap fragrance mix! I am sending you a bar of it in your package today and a Solid Lotion Bar scented the same! I hope you enjoy!